Does your child cry every time you pull out the flashcards and set a timer? Maybe online lessons with animated songs and stories to learn Times Tables the Fun Way will cure those math blues. We recently had the opportunity to review Times Alive, a colorful, animated, flash-based program that teaches kids the multiplication facts up to 9x9 with the aid of memorable mnemonics, catchy tunes, and fun activities. 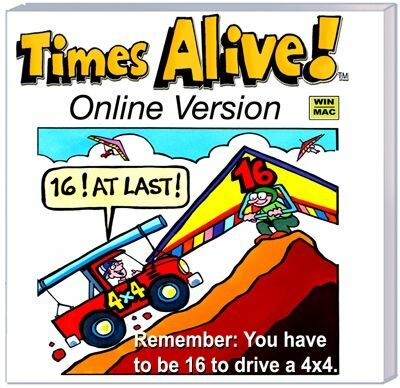 Times Alive is an interactive program based upon the popular book Times Tables the Fun Way from City Creek Press. Times Alive is completely online and requires no download. You can log into the website from anywhere, on any computer, and one subscription can be used by all your kids. Your child’s progress in the program is saved in your browser’s cookies, however, so if you periodically clear cookies, or use a different computer or browser, your progress will be lost. Times Alive can be also used on iPads with a compatible flash app. Please see the site for more details. For review purposes, we received 3 months access to this program. It is possible to complete the entire 18 lessons in one month. My 7-year-old 2nd grader is using Times Alive. When she first started the program, Emma knew zero multiplication facts. She understood what the x symbol meant and we had talked about the concept of multiplying. She could figure out a few of them by screwing up her eyes and counting on her figures. Or guessing. But she could not automatically recall any of the times tables. Times Alive begins with a pretest to see where your child is at before starting, and her results confirmed this. She gave up after trying for about 4 minutes because it was too frustrating. From there, she started with the first lesson. You can see from the lesson list that each lesson has a few different components. For each fact or set of facts, there is a colorful animated story, followed by a catchy song and then a “guessing game” (quiz) or coloring activity. There are also periodic tests that check overall progress. Tests are timed and can be completed on the computer, or you can print out a blank copy and use it any time. Once a test is completed, it cannot be redone unless you clear the results (a password is provided for clearing tests so you can have your child retake them). Other activities (including the quizzes) can be redone over and over. The program keeps track of your child’s progress and you can check it at any time by clicking the “Student Progress Report” button at the bottom of the screen. The progress report will show you which activities your child completed and what her scores were on tests, including the number correct, percentage score, and the time it took to complete the test. All activities (other than tests) can be done over and over again without resetting, but the program only keeps a record of the last time your child completed each activity. You can see from my daughter’s report that she went back and redid some of the activities again later. She also redid the tests after I reset them for her (more on that in a bit). What did we think of Times Alive? Emma loves the songs, the stories, and the coloring activities. She has been working through the program a few days a week, sometimes going through 3 or 4 lessons in a session. Her older siblings are not crazy about the songs, so I highly recommend headphones. Emma does not like the tests and has some difficulty with typing in the answers, both due to her inefficiency using the keyboard and the way you enter your answers. It’s really easy to get messed up if you have to back up to change an answer or fill in a skipped problem. Having the option to print out a paper copy of the test helps, but there is no way to record how your child does on the paper test within the program. I like the fact that Times Alive can be done completely independently, which frees up some time for me to work with another child. I am not in a rush to have her memorize the times tables just yet, so this is a fun extra and she is happy to do it. I also like how she can go back and do the lessons over and over until they stick. I did find one weakness in this program: Times Alive does not adapt to your child’s performance. If Emma scored 50% (or even 10%) correct on a progress test, the program would allow her to move on to the next thing without reviewing previous lessons. I could see from her progress report how many problems she got correct, but it didn’t show what problems she was getting wrong. The only way to know this is by watching her take the test or give her a paper test. I would love it if there were a way for the progress report to show me what she is getting wrong and to even have the program automatically loop her back to the lessons that seem to be giving her trouble. My solution was to just start her over in the program. I cleared her test results and had her retake the tests as she came to them again. When she starts bombing tests again, I just back her up to where she was doing well. This seems to be working and her overall progress, both in accuracy and time, is improving. Times Alive is worth a look if your child needs a fun, multi-sensory approach to the times tables. I'm really impressed with this review. As a fellow reviewer, I'll be back again to learn from your example. Thanks!